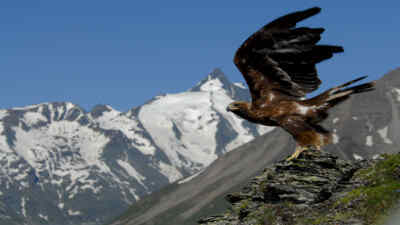 No other bird of prey is so closely associated with the Alps than the golden eagle. This mighty bird can have a wingspan of up to 220 cm. Its strongly plumaged wings and wide tail facilitates perfect navigation in thermal lifts, which carry the eagle. This bird is more of a glider than a flyer: while soaring through the air, he spies his prey with his “eagle vision” – small and medium-sized mammals, which he grabs and kills with his powerful claws in flight. His glance beyond compare is accentuated by brow ridges above his eyes – the golden eagle draconically and precisely sights his targets. 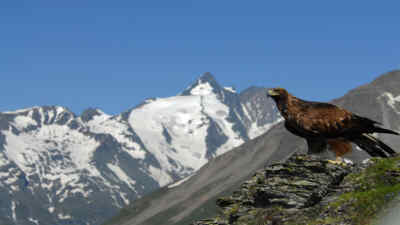 The golden eagle is one of the key alpine residents along with vultures, ibexes, chamois and marmots. Beyond its impressive size, it makes a great contribution to the ecosystem of its 50 to 150 km² territory as a hunter and scavenger. 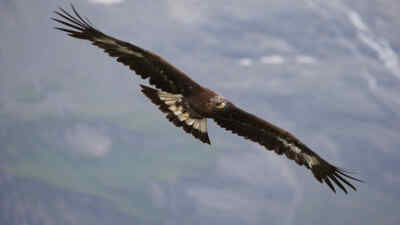 Golden eagle eyries can be found in large trees and on rock faces mostly below hunting grounds, which facilitates easy transportation of the prey to the eyrie. The approx. 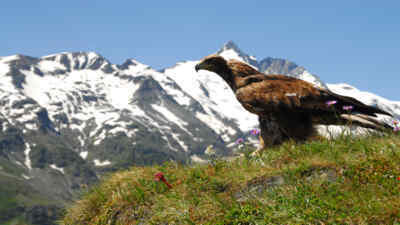 40 golden eagle breeding pairs of the High Tauern National Park live in monogamous permanent relationships and always have several eyries at their disposal. The 162 currently known nesting sites are located at altitudes between 1,100 and 2,100 m.
Ever since 2011 the eyries are subject to yearly monitoring with recordings of the population developments. Up to 15 squab grow up every year at the High Tauern National Park. When observing golden eagles, the squabs can be picked up easily. Contrary to the dark-plumaged older birds, they have white spots on their wings and a white tail with a black tip. Our tip: bring binoculars for your next visit to the Grossglockner High Alpine Road – you might be lucky and spy a golden eagle!